There are two major testing options for sister to sister tests. X chromosome testing is mostly used to see if two or more female persons with different mothers have the same biological father. 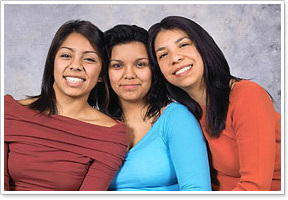 If the possible sisters have the same biological mother, then they must provide her sample to take this test. 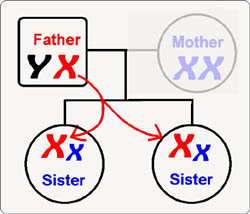 If you wish to know if the sisters have the same father and mother, or you are not sure if they have different mothers, then you will require a Full Sibling to Sibling Test. X-chromosome testing is your least expensive option while obtaining very high accuracy (99.9%+). All men have only one X chromosome, it is passed down from Father to Daughter, woman have two X-chromosomes. Therefore a Father and his 3 Daughters will all have at least one of their X-chromosomes exactly the same (the X from their father). If perhaps the 2 or more sisters that you want tested have different fathers that could be related, or if you want to know if the persons being tested have the same Mother, then you require a Full Sibling to Sibling Test.. This test investigates a high number of DNA regions. Full or half siblings will differ in the amount of DNA that they share. A Full Sibling to Sibling test looks at so many pieces of your DNA that we can make an assessment of your relationship. To have the Mother's DNA sample (from both or either sisters) reduces the test cost because the Mother's DNA helps us to analyse the relationship between the 2 sisters faster. f you are in a big hurry, and can't wait for the kit to be mailed to you, you can download the paperwork. Fill in the forms and mail in samples taken by a cotton bud.